We get e-mail:Can you tell me what your honest opinion of these paintings is? Personally, I think they are awful--romanticized stereotypes just as bad as the 'noble savage' images of adult Native Americans. At the public library where I look, someone donated similar paintings. I removed them when I first started working there, but now an older woman with political clout wants them hung prominently. She and I are both white, but my children are mostly Mescalero Apache. While the paintings in question at least do not have feathers in the hair, they are not what I want my children to see every day and think they have to look like! My opinion seems to matter little, however, and I am having a hard time finding things on the internet about images of Native children specifically. Thank-you for any help or opinion you can offer! I told Jones I agreed with her. I also asked my Native friends on Facebook what they thought of these paintings. The condemnations were mild, though nobody liked them.Well, shoot. They're sorta on the inaccurate side. Well, the artist clearly had talent, but I find some of the images reductive/potentially patronizing...what do others think? There are plenty of GREAT Native artists which should be hung in every library. I think the Nation closest to this library should donate their own collection that properly depicts Native children of that region.What's wrong with them? 1) The paintings present Indians as primitive people of the past. Only the boy dressed as a cowboy is arguably modern. 2) The paintings present Indians as Plains and Eskimo people, reinforcing the most common stereotypes. They don't recognize the wide diversity of Indian cultures. 3) Headdresses and feathers are for esteemed leaders and warriors--not for little boys and especially not for little girls. For more on the subject, see Why Hipster Headdresses Aren't Okay. 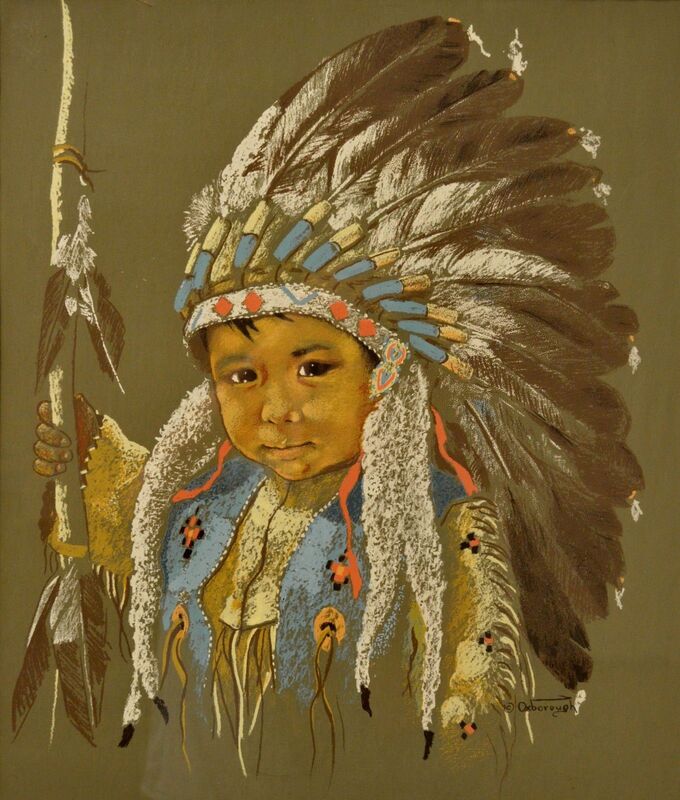 4) The paintings present Indians as chubby-cheeked, glowing toddlers. They have big, almond-shaped eyes and other cute features, but they're wearing grown-up clothing. This serves to romanticize and infantilize them...to neutralize any dark associations...to render them safe, soft, and harmless. As with Indian mascots and other romantic representations, you're supposed to think of them as colorful, exotic playthings--like human pandas. You're not supposed to think of all the genocidal acts your ancestors perpetrated. Or the continuing poverty, crime, and health problems among Indians. In short, these paintings don't come close to representing real Indian children. They reinforce stereotypical notions of Indians as primitive, childlike people of the past. As with puppies in a window, you're supposed to feel like paternalistic guardians to the helpless creatures. If you want to hang images of Native children in your library, I suggest using photographs rather than a white woman's romanticized paintings. Make sure they show modern as well as traditional children. Unlike Oxborough's paintings, that'll send a positive message. 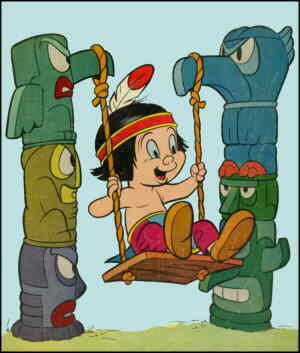 For more on the subject, see Romanticized Indians. Below: Cartoon images that convey the same message as Oxborough's paintings. This is the first time I'm seeing those paintings. Yet, I agree they are stereotypcal--feathers, heedresses. They actually look more caricatured anime rather than authentic people in portraits. The little girl would seem fine without the feather. I don't know why White people love to associate feathers/headdresses with Natives. 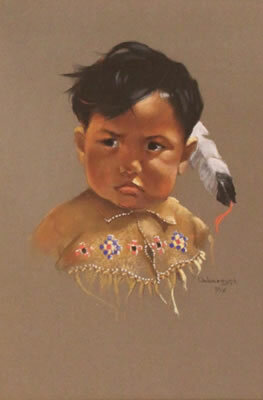 One more note, regarding that Eskimo child, is the bona fide stereotype of all her paintings. Skin is a little too bronze/dark than the average Alaskan Native. Eyes are too round/almond shape for a the traditional Alaskan Native. 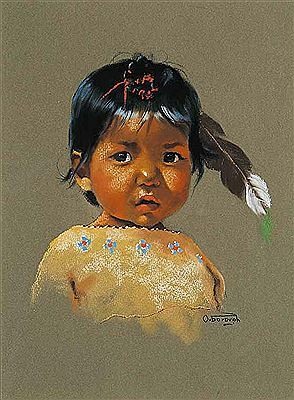 And all the indian children in her paintings do look similiar to one another. What's the difference between Indian and Latino? War of 1812 bicentennial without Indians? The Dudesons = treaty violation? Dudesons too "stoopid" to matter? Replace Jackson on $20 bill? Jewish politicians want Indians to "disappear"
Okay to stereotype in "satires"? Send minorities "back where they came from"? Name Alpine school for Reagan?